First International Conference on Abortion, Washington B.C., October 1967. These scientists decided by a vote of 19 to 1 (with a minority of 20% of whom were Catholics) that the unborn child is a human being, just as you and I are, from the moment of, or just following the moment of, conception when the two cells unite. Because of modern science, we know a great deal about fertilization and the early development of the child within the womb. When the sperm and egg unite, a new human life begins. It did not exist before. The sperm carried the genetic code of the father, and has no life or continuing function beyond that of one goal: to fertilize the egg. The ovum contains the genetic code of the mother and part of her body. It is not a new life, and has no other function than to be fertilized. 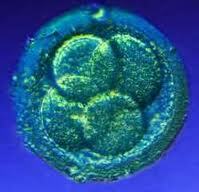 If the fertilization (uniting of the two cells) does not take place, both cells will die. The cells are from human beings, but are not human beings. But when the 23 chromosomes from the sperm unite with the 23 chromosomes from the ovum, a new being comes into existence. It is a unique human being, for none like it ever existed before, and none quite like it will ever exist again. It is a real person, just as real as you and I. Genetically, it is totally different from the body of the father or the mother. Organically, it is independent, programmed from within, growing in an orderly manner, moving toward further maturity. Although needing the protective environment of his mother's body, this living being is completely independent in its functions from the very beginning of his or her life, and at only ten days of age takes over complete physiologic control of certain functions within the mother's body. One example of this is that the unborn child stops his or her mother's menstrual periods.